If you’re like me and if someone texted you a photo of a Minion cake and asked you to make one for sweet little two year old Anley Jane’s birthday you would say, “Sure I can make that!” — and then you’d have to go online to see what in the world you signed up for!!! Even though my cakes have that “home-made” look, I do enjoy making them. But since our children and nieces and nephews have all grown up, I just haven’t had a reason to do it much anymore. In the last few years though, daughter Emily and her hubby Steven have been there to help when we did have a cake to make. Emily is an excellent baker and buttercream frosting maker and Steven can pretty much model anything out of fondant. Between the three of us, we make quite a team! Emily made batch after batch of buttercream frosting so we’d have plenty for the cake and both standard and mini cupcakes. She makes the best buttercream…so smooth and creamy and easy to spread on a cake! Now, for the decorations. 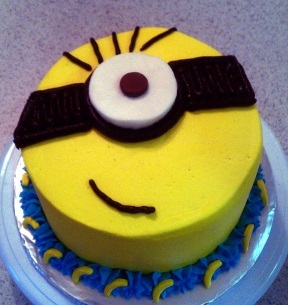 After researching different DIY decorating tips and techniques for making a Minion cake, I came up with some ideas I thought we could pull off. I thought using chewy chocolate candies for the smile and hair would be cute. 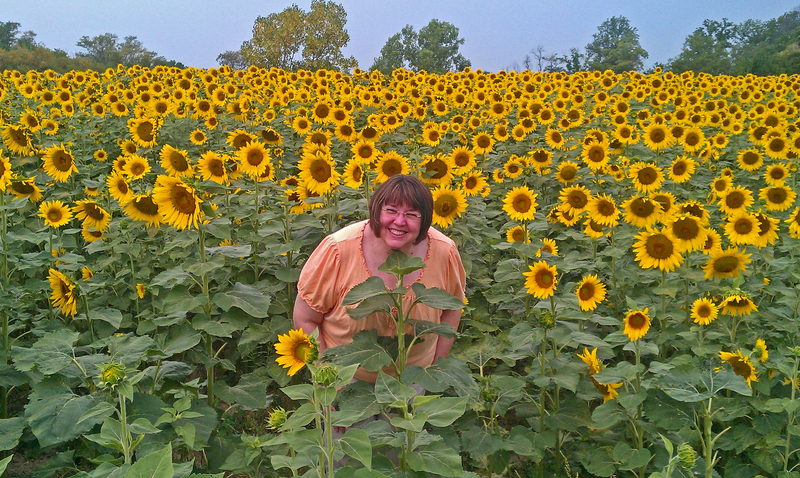 I was told it looked like poo …. so much for that idea! Then I ordered some black string candy that was cherry flavored thinking that would work better. The problem was the strings were all squiggly and wouldn’t lay straight. 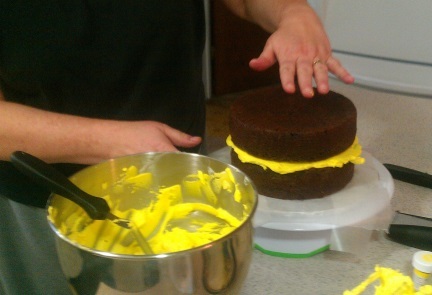 It’s really hard to make black frosting black, so we bought some in a can but the applicator was hard to control. Then Emily said maybe we could squirt all the black frosting into a decorator bag with the size tip we want and apply it that way. Tada!! That worked beautifully! 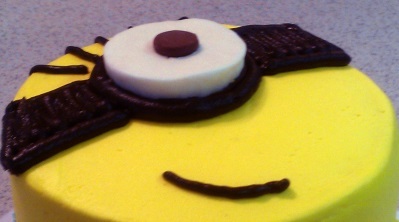 Add an eye that Steven made from a chocolate covered peppermint patty and sculptable buttercream with a chocolate kiss in the middle… and you’re almost done! 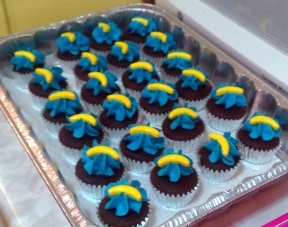 To bring in the blue that Minions wear, the cake and mini cupcakes were trimmed with blue stars and … we didn’t forget … bananas!!! Of course, we had to work the bananas into the design!